One of my New Year’s resolutions for 2014 was to write daily. I’m happy to report that I only missed a total of three days in 2014. I’m currently on a 250-day writing streak, and it’s become kind of addictive. Here’s some of what I learned about cultivating a writing habit. The idea came from a book called The Artist’s Way (which admittedly I haven’t read — but I’ve heard it’s good). They call it morning pages, which consist of three pages of writing done every day. It can be about anything that pops into your head — and it’s important that you get it all out of your head without editing or censoring in any way. If you can get in the habit of writing daily, it will help clear your mind and get your ideas flowing for the rest of the day. I initially started writing every day because I eventually want to write a book, but it’s become so much more than that. I use my daily writing as a way to think out loud, troubleshooting problems, thoughts, and anxieties I have. It gives me something to look forward to in the morning and actually puts me in a really good mood. A really tangible benefit is that I’ve written way more blog posts since I’ve started writing every day. Before, writing was something that I often needed to do — whether it was writing an email, a blog post, or a letter I’d been meaning to write — but never really found the time for. Figure out why you personally want to write more often. Is it to start a blog, to build a following, to become known as a thought leader, to connect with your inner voice, to develop a creative outlet, or to write a book? These are ALL good reasons, but it’s good to know which ones are most important to you and which ones aren’t. These will be your guiding forces that propel you forward when things are tough. But goals like that are almost meaningless and unlikely to help you create meaningful change in your life. Instead, come up with one or two trackable goals. My trackable goal this year was to write 750 words every day. Seven hundred and fifty words is about three pages handwritten (or one page typed single space). But there’s another reason I picked that number which will become more obvious in a second. Specificity matters. If you want to change your behavior, you have to know how to measure it. This is the really hard part, but in order to hit a big goal you have to develop regular habits in your life. When a friend introduced me to 750words.com, I was blown away. It’s a simple site where you go to do your daily writing. 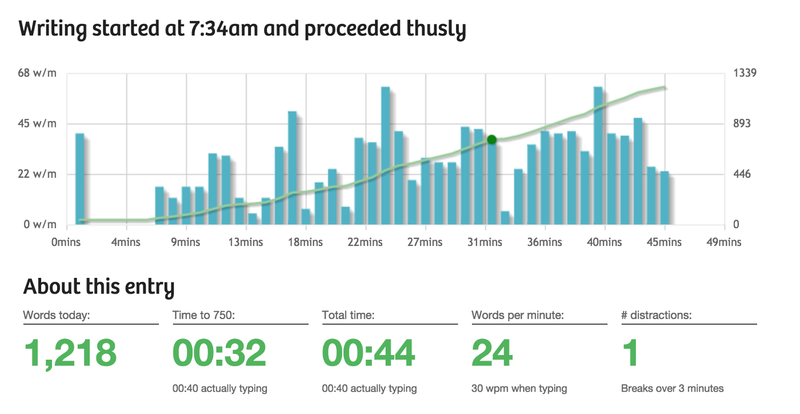 750words isn’t a publishing platform, it’s a personal tracking tool. It keeps track of your writing streak and gives you some really cool daily stats on your writing as well as badges for your accomplishments that keep things fun. Keeping track of streaks is a very powerful tactic for developing any new habit. Jerry Seinfeld used to keep a big calendar by his desk and mark an X for every day that he sat down and worked on his routine. Eventually his streak became so long that he kept going just because he didn’t want to break it (edit: this is a misattribution — see note). Like I mentioned before, I’m currently on a 250-day writing streak and the thought of breaking it pains me. At first I started by writing whenever I had time during the day. Sometimes it was in the morning, sometimes it was at night, journal-style, just before going to bed. The problem with this haphazard approach was that a whole day would pass by without me finding any time to write. Indeed, those three days of writing that I missed, I didn’t even realized I missed them. I thought I had written on those days. Eventually I settled on writing my 750 words first thing in the morning every morning. Do you feel like you don’t have time to accomplish your goals every day? Make time. The best thing I ever did for writing and habit development in general was start waking up earlier. Recently there has been some research saying that seven hours of sleep per night might be better than eight. So now I try to be in bed by 11:30 p.m. and wake up at around 6:30 a.m. every morning. On top of the badges and stats that 750words.com gives me, I’ve had to find other ways to make it fun and kill the tediousness I sometimes feel. Initially, I started by writing in different styles every day. One day would be murder mystery, then science fiction, then romance. Sometimes I write letters to my parents or my friends. They really appreciate those. It might sound weird to write in a different genre or style than you’re used to, but three pages goes by pretty quickly, and then you get to never look at it again if you don’t like it. Find a friend to keep you accountable and make it more fun. Pippa eyed the watermelon two over from the end on the left because it reminded her of her ex-boyfriend. “This one will be perfect,” she thought. Though most of the time I just write in free-form every morning. I’ve been able to get the total time it takes to write 750 words down to about 10–15 minutes. I’ve started keeping a notebook of writing prompts in Evernote in case I’ve run out of ideas or I want to finish a blog post (this is actually one of them). During the day, I come up with ideas, add them to Evernote, and then I write about those in the morning. Right now, the list includes “What I’ve learned so far in 2014,” “There’s no expectation of privacy on the Internet,” “On people holding subway doors,” and other random thoughts I have on the subway. It will take you forever (about an hour) to write 750 words if you worry about format and editing while doing the creative stuff too. Most people recommend separating the two actions. Get comfortable with having tons of typos and your writing being mostly nonsense. If you want, you can edit it later. This can be hard so a trick I’ve learned to accomplish this is to turn the brightness down on your computer screen so that you can’t read what you’re writing. A lot of times, I’ll pick an idea from my Evernote notebook of blog post ideas and write about it for 750 words. Then I’ll take that writing and upload it to Medium for editing. I usually do one round of personal editing and then send it around to a few friends (using the “share draft” feature) before publishing. Some of my most successful blog posts have been developed in this way (including How to get a busy person to respond to your email and How to never forget anything ever again). Do you have any other tips for developing a daily writing practice? Have you read anything about techniques famous authors used to write every day? Post a comment! I’d love to hear them.